Agricenter International, the education, agribusiness, research and agricultural hub of the Mid-South has a $524 million annual economic impact on the region, hosts over 1.3 million visitors annually, and educates 10,000 students a year. As a non-profit dedicated to advancing knowledge and understanding of agriculture, Agricenter’s educators offer enrichment classes that focus on science, technology and the environment. Your support is invaluable in Agricenter’s efforts to provide high quality educational programs. Many programs like our Ag Tech Career Forum, are unique experiences for students to learn from experts in the field of biotechnology, agronomics, conservation and ag technology and introduce them to amazing career opportunities for their future. Without this critical funding, these students will never see our living classroom. When you contribute to Agricenter, 100% of your donation goes to our educational and outreach efforts. The 5th annual Feast on the Farm Gala is a country chic evening of fun with the area’s finest chefs. 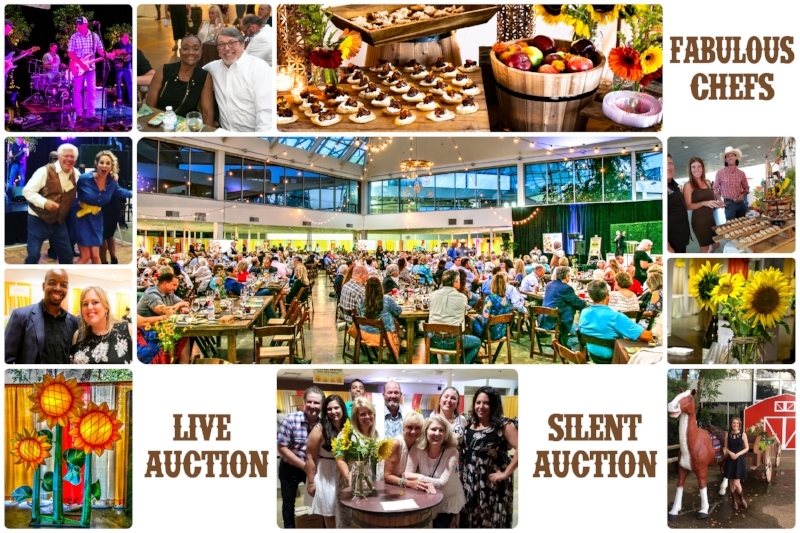 Over 400 community leaders, supporters, and friends enjoy music and dancing while raising funds with live and silent auctions. The event provides the broadest array of premium marketing opportunities. Proceeds from the event help to meet the needs of Agricenter’s education program. Your sponsorship ensures that the next generation gains an awareness for agriculture, forestry, and all our natural resources. This 2nd annual event is designed to celebrate the economic impact of agriculture, innovation in the industry and student artwork that illustrates a specific agricultural theme. The program will focus on raising awareness and increasing understanding of the ag industry with participating educators, students, businesses, community leaders and media. Partners and sponsors will showcase their company’s contribution to ag at an interactive exposition following the celebration program featuring a panel discussion with innovative companies and art competition awards ceremony. Each spring, Agricenter hosts the annual Junior Fishing Rodeo at Catch’em Lakes where catfish are plentiful. The lake is fully stocked with catfish and children ages 5-13 participate for prizes in categories of size and number of catfish. Over 100 youth participate and get to experience this recreation, some for the first time. This 16th annual event is free to the public and attracts 4,000 people. Activities include: pumpkin painting, carnival games, arts and crafts, hayrides, fair food, education station, and an educational tour of our farm showcasing the major crops grown in the Delta. Over 500 Future Farmers of America and other high school students in the tri-state area descend on the Agricenter campus to learn about technology and careers in agriculture. The focus is on plant science, research, and the technical solutions used in the field. Company partners speak about precision planters, monitoring the growth of the crop via drones and computers, the sale of the crops, and other topics. Students meet with college recruiters.